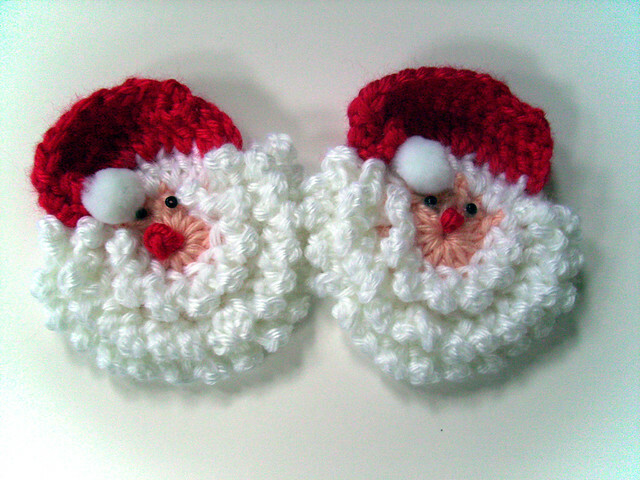 mary maxim's santa face crochet pattern is back! Yes, I know it's just the beginning of August, but I was very excited to spread the news. Each time I post photos, everyone either wants me to make them or find out where I purchased the pattern. For years, I've had to tell people that the pattern is no longer available for purchase, and I'm just not the type of person to photocopy a pattern and mail it out to everyone. But there's good news. I received the latest Mary Maxim catalog a couple days ago and was browsing through it this morning. You can't imagine how excited I was to see that they're selling the pattern again! You can claim the pattern for your very own by clicking here. It includes the pattern and yarn for only $9.99. Make sure to check out their other stuff, as well. I just ordered their Little Blossoms Blanket Kit to Knit on Wednesday, and I'm so excited to get it. For those of you subscribed to their mailing list, you'll also know that they're offering free shipping on all orders over $60 until end of day today. Older Posti designed my own hat with robyn chachula!